In Singapore my husband and I took our children to Thaipusam, a Tamil religious festival. Hindu penitents carry milk jugs, impale themselves with fishhooks, and walk two miles on nail shoes. Our expatriate friends in Singapore thought we were crazy. “You are taking your children to Thaipusam?” said a friend. He shook his head. He had never gone, but he had heard about it. The traffic was snarled! People drove metal spears through both sides of their cheeks! Expats and Singaporeans alike seemed surprised that Thaipusam went on in Singapore, Singapore with its sleek high rises where the expatriate Westerners swam in blue swimming pools and Filipino nannies handed the children thick expensive towels. Thaipusam and its “primitive” mortification had nothing to do with modern Singapore, they said. I was not sure about taking our daughters to Thaipusam. They were six and four. We were living in Singapore for six months while my husband taught at the National University of Singapore. Because we both study religion, and because Clark teaches regularly in Asia, our girls have bowed before monks in Chiang Mai and given them money. They have seen Koreans speaking in tongues in the largest church in the world. They spent six days going through the Hindu and Buddhist temples of Angkor Wat. But watching a spear being driven through someone’s cheek? Thaipusam seemed like a ritual too far. Twenty years from now, they might be sitting in leather chairs in psychologists’ offices and saying, I didn’t drive a metal stake through my cheeks but I am scarred! And then we went to Thaipusam, and watched spears being driven through people’s cheeks. Pain and suffering play central roles in many religions. Buddhism begins with the premise that suffering is the central human experience. Human attachment—“seeking delight here and there, that is, craving for sensual pleasures, craving for existence, craving for extermination,” as a classic text puts it—causes suffering. We want to eat, we are hungry, we eat. Then the meal is done, the dishes are smudged, and we are hungry again in the morning. Buddhism calls attention to the transitory nature of desire and satiation: “the remainderless fading away and cessation of that same craving, the giving up and relinquishing of it, freedom from it, nonreliance on it.” When we realize the illusory nature of all attachment, we will move towards a higher level of awareness. I enjoyed that Greek salad, but I have eaten it, and it is gone, and the moment is gone. And beyond that: as my friend Sondra Hausner, a scholar of Asian religions, writes me, “The thing you want is a moving target.” Sometimes we want dinner, sometimes love, sometimes money—but they are all shadows cast on the wall, not even shadows of something real, but the shadows of illusory hands grasping for something that doesn’t exist. Buddhism formulates the question of suffering differently than Christianity. Still, suffering and pain play important roles in Christianity, as in many other religions. “The central symbol of Christianity is the figure of a tortured man,” Stephen Moore writes in God’s Gym. The son Jesus calls out to God his Father in the moment of agony, Why have you deserted me? He might as well have asked, Why did you let me die? God permits his own son to be killed. In a way, God kills his own son. Religions do not anesthetize pain. They put pain at the center of their worldviews. But why? Why did people have to drive stakes through their cheeks? Why might they impale themselves with fishhooks and walk two miles? The Christian ascetics known as the Desert Fathers and Mothers, the first Christian renouncers who moved out into the edges of the Egyptian and Syrian deserts in the fourth and fifth centuries, mastered the arts of suffering. One hung a cucumber in front of his nose as he fasted. A handful of famous Syrian ascetics sat on top of pillars for years. Some holy men and women associated the body with sin. “When the body is cherished, the soul is withered,” one monk was reported to say. By drawing closer to God, they could distance themselves from the “passions” of the body. A famous Desert Father, Arsenius, admonished a brother to “try hard to make your inner progress as God would have it, and by this overcome the passions of the body.” Conversely, people could discipline their own bodies to achieve greater spiritual awareness: “Fasting dries up the channels down which worldly pleasures flow,” according to another Desert Father. The desert ascetics’ harsh renunciation made sense to me as a college student. For me, as for some others, the body was a problem, not an answer. One anorexic woman ate only spinach with chickpeas, without dressing. She diminished this to twelve chickpeas. Then she ate only four chickpeas for dinner. I tried and failed to emulate her painful discipline. She reminded me in some ways of the monk fasting and gazing at a cucumber, even though we lived in different worlds from the early Christian ascetics. The Desert Mothers and Fathers fasted in a world preoccupied by hunger and nested with demons. They fasted to find transcendence. We abstained, or tried to abstain, in a world privileged by overabundance and haunted by runway models with angelically thin bodies. In trying to fast, I wanted to get beyond the body, the body which seemed then so heavy, so grossly weighty, veinous, spackled and carnal. Transcendence looked then like getting outside of the body and self-consciousness, rather than encountering the divine through the body. Fasting exists in many religions. During Ramadan, Muslims fast from sunrise until sundown. Jews fast on Yom Kippur. Medieval Christians observed fast days during which no meat could be eaten, as well as days of completely refraining from food. In preparation for Thaipusam, the Hindu participants eat only once a day for a month before the festival, and they eat only a vegetarian diet. They sleep on mats on the floor instead of beds. The night before Thaipusam, they do not eat at all, bathe themselves in ritual baths, and paint their bodies in sacred ash. Physicality itself—being a baby, being a human—stands between the human and transformation. And so for sadhus the body itself is a problem. As one sadhu said, “There is no love for a yogi’s body. We live in the jungle.” The jungle is everywhere, even in the city. On the subway to Thaipusam, the train filled with Tamils in their best saris and pure white shirts. A Tamil girl adjusted her orange sari, an orchid in her hair. All her sisters and aunts and mother in saris lined with silver and gold threads glittered in a row behind her against the gray wall. Of the three ethnic groups in Singapore, the Chinese, Malay, and Tamil, the Tamils are the smallest group, less than one-tenth of the population. Tamils make up the lowest class in Singapore. Many clean the public bathrooms and work in the ports. We emerged out of the subway to see, in the hot bright afternoon, a nearly naked man encased in a huge birdcage with red and blue feathers. He danced in a circle of supporters. Police stood along the street with low houses and shops, and along the road blocked off by barricades. People were selling garlands of flowers from carts. 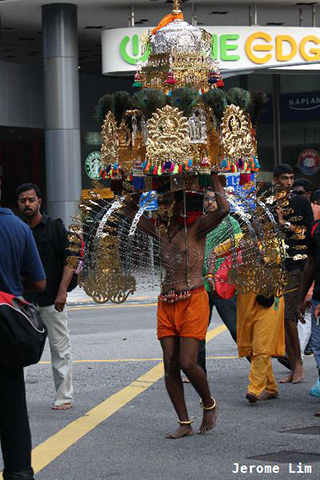 The birdcage was one form of “kavadi,” or burden. Another woman walked past us carrying a silver container of milk on her head. Another man pulled a heavy wheeled structure which attached itself to his skin with fishhooks or with metal spears. He had a spear driven through his cheek. At the entrance to the temple, volunteers passed out free sandwiches and cups of juice. We shook our heads, nervous about intruding. The cheerful woman said, “It’s for everyone! Not just in Thaipusam! Take a sandwich! Come in and see!” The temple was an open courtyard with a roof. Other participants were getting ready in the shade of the temple. Right in front of me, an older man was inserting fishhooks into the back of a serene man, with his friends watching and commenting enthusiastically. Everyone took pictures, like prom night. Another man impaled with hundreds of fishhooks joked with a friend as he waited in line to start the walk. The man with the birdcage attached to his skin with fishhooks looked happier than most Americans in their cars on their Tuesday evening commute. “I want to see someone get a spear through their cheeks!” said Cecilia, whom nothing bothers. A young, muscled man was sitting in a folding chair. His friend and family circled him. Someone pounded a drum faster. People clapped harder and harder. An older man, spear in one hand, leaned over the young man. The spear was larger than I had imagined. The spear easily passed through his cheek. He winced. The girls watched with a practical interest. “He’s not bleeding!” Chiara whispered. “That was great!” Cecilia whispered back. 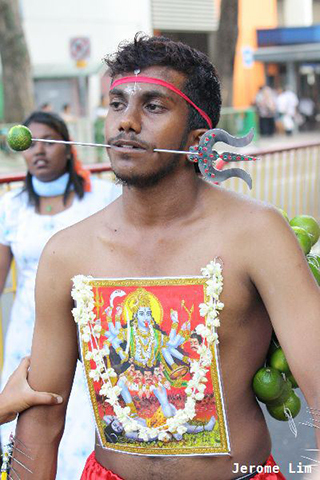 Later someone told me about how his friend had decided to carry a kavadi in Thaipusam but did not believe in it. When the spear was driven through his cheek, he bled effusively, so much that they almost took him to the emergency room. Why would people inflict this suffering upon themselves? Why would a religion ask this of its adherents? Sometimes, I read, people described Thaipusam as “penitential.” But this is not entirely accurate. The kavadi-bearers have made vows to Lord Murugan to avert a catastrophe or to ask for divine intervention. Most participants describe gratitude and thanks as motivating them. One participant made a vow to carry kavadi if his father recovered from cancer. Another carried kavadi as thanks for good results on his university exams. At first glance, Thaipusam looks like a mercenary exchange: physical pain in exchange for earthly rewards dispensed by a divine bank in the sky. We watched the Thaipusam procession, like float after float going by, and the girls started to step on each other’s feet and complain. So we ate dinner. Having small children taught me to see humans very differently. If they were crabby, I asked myself: Are they hungry? Are they thirsty? Are they tired? I started to see my own moods differently, too. A bad mood usually meant I had skipped lunch that day. For us, as for the Hindu sadhus, as for the Christian monks in the desert, the body had its own raw existence of hunger, pain, and pleasure. A Desert Father named John went into the extreme desert to become an angel. The Desert Fathers and Mothers did not live in the sand dunes of the Egyptian desert near Siwa. Rather, they settled on the arid edges of settled land, as the desert shaded off into brown away from the green Nile delta. John returned after a week. When he knocked on his brother’s door, his brother asked who was at the door. “John,” he said. The anorexics became angels. Or they decided to live among us and learned to eat again. It is no longer possible to become an angel. It is no longer possible to eat four chickpeas. We have to eat. The body insists. One aged Desert Father advised another about fasting, “Every day one should deny oneself a little in eating, so as not to be satisfied.” (A friend’s uncle told him the same thing: “Always get up from the table a little hungry.”) The other Desert Father said, “But when you were a young man, didn’t you fast two days and more?” And the old man said, “Two days, believe me, and three, and a week… but the old men found that it is good to eat a little every day, and on certain days a little less: and they have shown us this master road, for it is easy and light.” Like the Buddha, many Desert Mothers and Fathers taught moderation, not the extremism of angels and cucumbers. In him are woven the sky and the earth and all the regions of the air, and in him rest the mind and all the powers of life. Know him as the ONE and leave aside all other words… Where all the subtle channels of the body meet, like spokes in the center of a wheel, there he moves in the heart and transforms his one form unto many. So we ate dinner in a crowded restaurant. We ate swirled fried cones with spicy curry and mild curry. Chiara tested the spicy curry. Cecilia— fearless about viewing human internal organs up close in a laboratory, but cautious about tasting spicy food— declined. The girls ate because they were hungry. They stopped when they were full. The parenting books I read claimed that children up until about age five eat when they are hungry and stop when they are full. After about age five, children start to eat for other reasons. The French philosopher Georges Bataille wrote of how early humans lived without understanding themselves as distinct from others. They lived immanently, like “water in water.” The girls lived almost like this. They lived immersed in their bodies. They did not see their bodies as either problems or answers. But almost certainly they would lose this sense of themselves. Night in the tropics drops itself down without warning. We tried to get into a taxi to go home and put the girls to bed. But the girls objected indignantly. During Thaipusam while piercing the spikes you will surely feel the pain. No one can deny that, but what one has to do is pray to God to ask for encouragement and strength to overcome all pain. I feel that one has to go through a range of pain and suffering for the sins one has committed knowingly and unknowingly. Taking part in the rituals does physically hurt me, but at the end of these rites I feel as if I had won the battle or accomplished something great. We humans live with pain. Pain is part of the unshakable facts of being human and animal, part of the contract you never sign when you are born. My daughters may not put fishhooks in their backs, but they will go to junior high. Friends will stop talking to them. It will cause them pain. In the dark summer backyard in Connecticut, an animal screams in pain as another eats it. We hear the screams and we cannot help. But no one at Thaipusam carried their kavadi alone. Everyone we saw had a group of friends and family walking with them. One man pulling a huge cart looked on the verge of collapse. Cecilia pulled on my arm and whispered, “I’m worried about him.” His supporters saw it too, and they started clapping and cheering. The man straightened and pulled harder. Then I realized where I had seen Thaipusam before, or something very like it. People handed out Gatorade and free food. Groups of families and friends cheered on the participants. The participants struggled, in pain, down a paved street that had been roped off on both sides. The police milled about sociably. People cheered. Thaipusam was the New York marathon, with fishhooks and nail shoes. For the Desert Mothers and Fathers, the body could be perceived in two ways, as the scholar Patricia Cox Miller argues. As seen against the horizon of immediate objects, the body signified the impermanent, the temporal, which a person might dangerously “cherish” more than the soul. The body fell short of the perfect bodies of humans in the Garden, the divine bodies. “The body was perceived to be problematic, not because it was a body, but because it was not a body of plenitude,” writes Cox Miller. Near the steps to the final temple, the crowd pressed happily against each other. We put the girls on our shoulders. 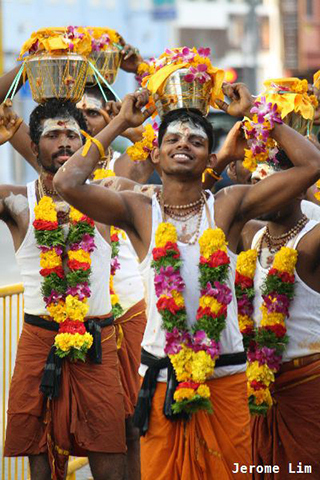 The kavadi-bearers put on giant nail flip-flops to climb the steps to the temple. The nails were pointing outwards. We tried to excuse ourselves from entering the temple but people insisted. “Go in! Go in!” they mouthed over the noise. We had no choice. The crowd forced us into the temple. The kavadi-bearers danced inside the hot temple. The huge birdcages whirled around their bodies. The body no longer burdened them. As another sacred text puts it, “Where all the subtle channels of the body meet, like spokes in the center of a wheel, there he moves in the heart and transforms his one form unto many.” The body was a permeable membrane which divinity washed into and moved out of in waves. Those who worked on the docks and delivered groceries: here at Thaipusam, with flower garlands around their necks, they were the nimbus of the sun. This our bodies can do, radiant against a bright horizon. They dazzled, like the marathoners, after they cross the finish line, stand draped in their silvery heat blankets. Each person took the milk from their kavadis and poured it over the statue of the spear. An ultra-marathoner fumbled to explain why she runs 100-mile races to a friend of mine, and then said, “It’s great doing something that goes beyond.” The going beyond is to a body of plenitude. At Thaipusam, as at the New York marathon, the participants prove to themselves their ability to endure physical suffering. The kavadi-bearers and the marathoners are like my friend Jenni, whose husband’s cancer kept recurring. “How do you do it?” I asked her. And she said, “I just keep putting one foot in front of another.” The kavadi-bearer keeps walking. The runner keeps putting one foot in front of the other. Sadhus and the Desert Fathers and Mothers are the extreme marathoners of religion, the people who run one hundred mile races: atrophied limbs, hair shirts, sleeping outside in the winter without a blanket, sitting on pillars. But most sadhus and most Christian ascetics of late antiquity aimed not to become superheroes, but instead to live more moderate and continuous lives of denial. And modern observers might think that kavadi-bearers, or the monk gazing at a cucumber while fasting, engaged in “primitive mortification,” practices which we American moderns have abandoned. But Americans have not abandoned these practices. We run marathons instead—religion poured into new vessels. The body is a holy problem but also a holy solution. People impose bodily pain upon themselves in order to test the possibilities of their own bodies, and to ‘go beyond’ in the body itself. The Christian ascetics in the desert, the kavadi-bearers, and the marathoners lived completely and immanently as their bodies. The point was to experience the body. Go in your cell, taught one Desert Father, and your cell will teach you everything. And the solution of the body is a communal solution, not the anorexic’s lonely four chickpeas. The French sociologist Émile Durkheim, who was reportedly a dry and serious man, identified the central place of religious collective experience in religion. He called it “collective effervescence,” when collective, group experience bubbles over into ecstasy. You can feel collective effervescence at a Pentecostal service, but you can also feel it in a huge football stadium, with the whole roar of the crowd, or at the finish line of the New York marathon. Like a marathon, like a football game, religions give humans stories by which they can tell the stories of their lives to themselves, the painful and ecstatic experiences of embodiment. 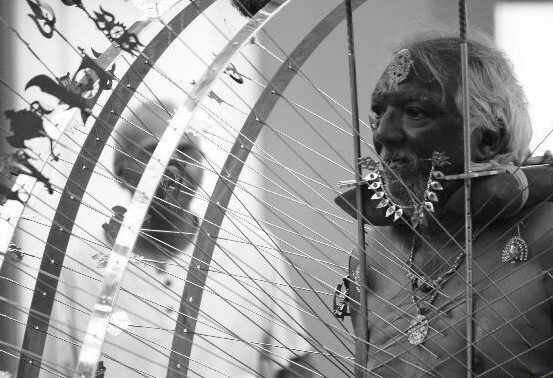 Thaipusam gives people a way to live with the pain and to transform it. They choose to impale their backs with fishhooks. They drive spears into their bodies as an act of gratitude. They walk surrounded by a circle of family and friends, along a street lined with cheering and clapping supporters. For a day, they place their bodies against the shimmering horizon of the permanent. Their bodies exude flame. As at Thaipusam, as at the New York marathon, as in our very human lives, we carry the kavadi of our humanity and pain. We live in the jungle. And we want our children to be able to carry their kavadi. Religions teach us how to carry our kavadi. No one carries the kavadi alone. And the bearing of the kavadi itself can itself be the holy solution—the ‘going beyond,’ the body in its full plenitude, profiled against the flat gold of eternity. Photos by Jerome Lim, The Long and Winding Road used with permission. Think you might want to rectify your statement ” Tamils make up the lowest class in Singapore. Many clean the public bathrooms and work in the ports.” Not sure where you get that from. Maybe you haven’t been here long enough to assimilate where they stand. Not sure about you but almost every person I’ve met,be it a local or foreigner agree that Indians make up about most of the the higher classes of the hierarchy. A lot of Indians are either doctors,lawyers or engineers and dubbed as hardworking and accomplished. In Singapore, Chinese make up the majority,so I would agree that Indians are infact a minority here. But for a minority, the percentage of Indians in accomplished fields is very high and make significant contributions. You can check on the political background of Singapore to see how Indians have been one of the biggest economical contributors to Singapore and hoe the Cabinet/Parliament is made up by many Indians. I’ve seen more Malay and Chinese toilet cleaners than Indian ones to be honest.And if you inquire well enough, you will learn that they are Malaysians who travel to Singapore daily to work for a living. The same can be pretty much said about port workers. I hope this serves as clarification to your misstatement and you can correct it. This is quite a sensitive issue to be making such a statement. There has been many scenarios where individuals have been chastised or charged for making similar statements but maybe with a more defamatory intonation . I know you probably didn’t mean for it to come off like that but just my two cents worth. Hi Greta Austin, i bumped into your blog as i was reading an article on Thaipusam which falls on Feb 9, this year. You have written well in your own opinion. I enjoyed reading untill you mentioned a very degrading statement of Singapore Tamils. You mentioned that Tamils are of lowest class here. Sorry Greta. You are completely WRONG!! Most of the cleaners you see here are Malaysia Indians and India Indians. Please get your facts right before you post next time. Singapore Indians/Tamils are over or well represented; be it in politics, government/private sector and academically. Moreover i am surprised that your husband was teaching in NUS!! God Bless! !